This lesson unit is intended to help you assess how well students are able to visualize two-dimensional cross-sections of representations of 3-dimensional objects. In particular, the lesson will help you identify and help students who have difficulties recognizing and drawing 2-dimensional cross-sections at different points along a plane of a representation of a 3-dimensional object. Before the lesson, students work individually on an assessment task designed to reveal their current understanding and difficulties. You review their solutions and create questions for students to consider, to help improve their work. During the lesson, students work in groups on a collaborative activity. They match representations of three-dimensional objects with two-dimensional cross-sections. Students then share their work with another group. Each student will need a copy of the two assessment tasks, Vessels of Water and Vessels of Water (revisited), a mini-whiteboard, pen, and eraser. Each small group of students will need the cut-up cards Flowing Water and Shape of the Surface of the Water (1) and (2), a large sheet of paper for making a poster, and a glue stick. 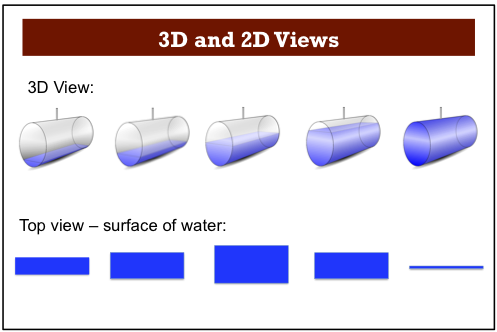 For the introduction, a real example, such as soda bottles filled to different levels with colored water, may help students visualize the two-dimensional cross-sections. In the collaborative activity students may also benefit from seeing real examples of the three-dimensional objects such as cones, hemispheres, cuboids, triangular prisms, and rectangular pyramids. 20 minutes before the lesson, a 75-minute lesson (or split into two shorter ones), and 20 minutes in a follow-up lesson. Timings are approximate and will depend on the needs of the class.